Structural fumigation is the time tested method of eliminating Drywood termite colonies in any building. Pestguard uses Sulfuryl Fluoride Gas Fumigant which has been trusted for over 40 years and in more than 2 million homes as the fumigant of choice for Drywood termites. The structure must be vacated during the procedure. 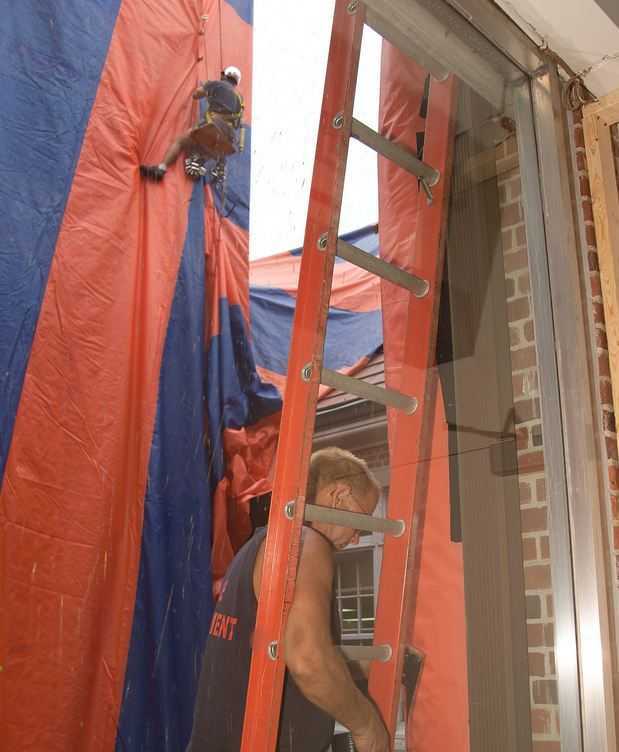 Pestguard uses the standard three day procedure in which the building is wrapped in tarps and the fumigant is released into the structure on the first day; the building is aerated on the second day and cleared for reentry the third day. Under special circumstances, we have completed successful fumigations in less than 24 hours. Fumigation with Sulfuryl Fluoride penetrates into every nook and cranny of the entire building to eliminate all Drywood termites within the structure. Sulfuryl Fluoride achieves this by penetrating through the pores of the wood or any cellulose material. This is done at the microscopic level as wood under a microscope looks just like a sponge, full of pores. The Sulfuryl Fluoride will penetrate these pores traveling throughout the wood eliminating all the Drywood termites along the way. Even painted or sealed wood can not stop Sulfuryl Fluoride from penetrating either through the ends, kick out holes, scratches or even from behind the unpainted back side of the wood just to name a few. Sulfuryl Fluoride is contained within a structure with tarps for a period of time that is determined by numerous factors including wind speed, relative humidity, size, foundation, exposure time, target pest even the power of the fans used for circulation. The efficacy of this procedure has been confirmed by more than 40 years of practical use, university research and published reports. An additional benefit of fumigation is the elimination of any other pests that may reside in the structure. Pestguard has the experience of performing large scale fumigation projects on the west coast of Florida. Our experience includes fumigating the 1,200 unit Westin Innisbrook Resort; the fumigation of the historic Townes Leigh Hall at the Gainesville campus. We have also fumigated countless other large multi unit condominiums from Tarpon Springs to Naples. All of these projects were completed on schedule and remain termite free. These experiences makes us uniquely qualified to handle the logistics required to achieve the desired result.